MDRS Crew 133 commander Paula Crock, at right, spent several months at McMurdo Station in Antarctica. 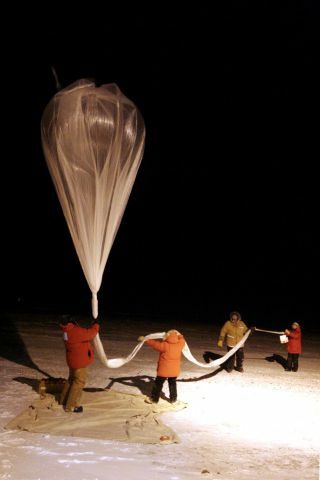 Here, her crew launches a zero-pressure balloon to study ozone in the area. If a solar flare is on its way to the Mars Desert Research Station in January, Joseph Jessup wants to make sure Crew 133 is prepared to react if necessary. That's why he's driving from Arizona to the Mars Society facility in Utah with a radio telescope in the back of his car. His portable telescope can not only detect solar particles at a range of 20 megahertz, but at night (after the sun has set) could be turned to Jupiter to spot electromagnetic radiation emanating from the immense planet. "It would have some applications for some kind of an early warning system on Mars," Jessup told SPACE.com. With training in paleoanthropology, planetary geology and mapping, Jessup shifted his attention to design and construction of a hybrid planetary spacesuit for his UND thesis project. Jessup additionally plans to map geological layers at the MDRS site from satellite imaging and on-site sampling, reconstruct the erosion pattern, and try to determine what it looked like in the past. Leading the crew will be Paula Crock, the person with the most experience in space mission simulations. She was at MDRS twice last year and even spent a winter in Antarctica leading a team that sampled ozone in the area with zero-pressure balloons. "I loved it," she said of her McMurdo Station stay. "I thought it was fantastic looking at the stars during a lunch break, and there's no light pollution when you get out of town." Working in the cold and the dark also taught Crock much about commanding a research crew. She had to make sure that six people were able to work through the launch process — each balloon cost $600 and like a dry cleaner bag, they were easy to puncture — in extreme weather conditions. "It was a six-man team, and in addition to this complicated procedure for launching, we’re in Antarctica," Crock said. "In the winter it was minus 35 [degrees Fahrenheit]. There were significant safety issues, too." One Crew 133 MDRS experiment will use a computer program to monitor anesthesia injections on simulated astronauts. While running the crew, Boston-based Crock plans to test a device that monitors the temperature inside of a spacesuit helmet during excursions. She tested a prototype last year and made some improvements since then, she said. After EVAs, she will distribute questionnaires to participants concerning exertion levels. Matthieu Komorowski, a newly certified medical doctor from Lille 2 University in France, plans to test out software to simulate anesthesia on astronauts. "I pretend to inject the astronauts with some anesthetics, and I assess mostly their cardiovascular responses to the drugs," Komorowski told SPACE.com. He said the response to drugs can change on the less potent gravity of Mars. UND student Gordon Gartrelle, a retired IBM sales executive, plans to examine the site for ancient hydrothermal activity. Since evidence of the earliest life on Earth came from these sorts of sites, he told SPACE.com, Mars microbes could potentially be in the same areas. Also on the crew will be Pedro Diaz-Rubin, who will do astronomy experiments.